We encountered an issue when we created a custom property in the User Profile Service Application and we wanted to move this property to ‘Contact Information’. We could click on the up arrow but the property remained on the same spot after the refresh. We have discussed this issue with Microsoft and they have provided us with the below solution. This solution is not yet fully supported on SharePoint 2013 and they are in the process of creating a KB article for this issue, but this can perhaps help you as a workaround. 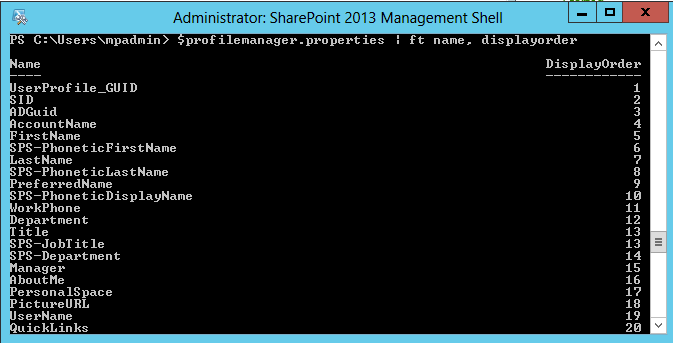 You can view the display ID with PowerShell for all user properties using the following commands. My custom property has the same order as ‘Picture Placeholder State’ which perhaps stops it from moving up. You can set the display order for a property using PowerShell but always make sure this ID does not exist and only use this command when you get stuck from moving a property up. 4. 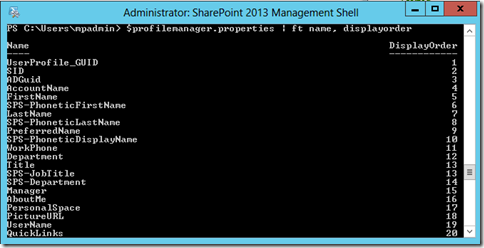 Click on Administrators and add the account which you are using to run PowerShell. Also add the farm and service account. I don’t know for sure if the Application Pool accounts also need permission like in steps 4 and 5 but they had full control on our environment.